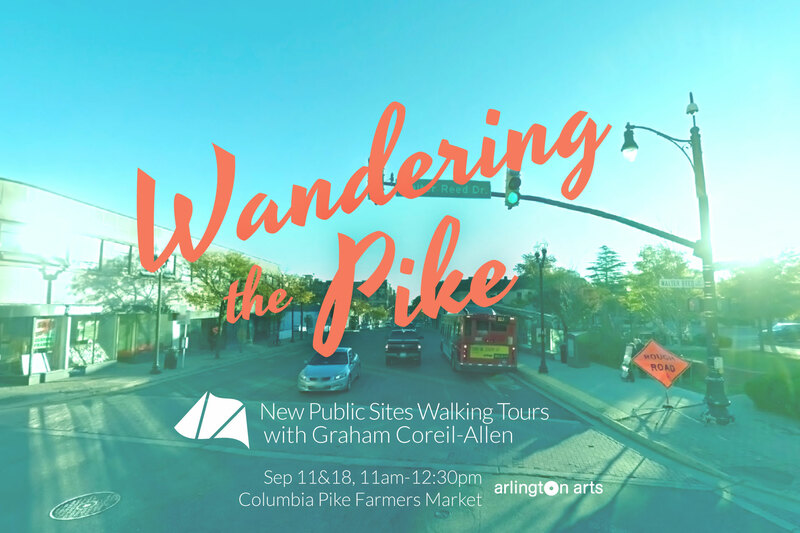 Join public artist Graham Coreil-Allen to explore and reimagine the urban and suburban spaces of Columbia Pike in Arlington, Virginia on this alternative walking tour beginning at the Columbia Pike Farmers Market. All are invited to participate as we take turns sharing our insights into the history, design and uses of everyday public spaces. The former rural toll road served as an early economic lifeline connecting Washington DC to Virginia. Columbia Pike quickly grew into a booming stretch of motorist amenities at the expense of pedestrian safety and accessibility. Wander the Pike to experience firsthand how residents and leaders are helping to transform the suburban drag into an walkable main street for all. Click here for more details on the tours. Free and open to the public. RSVP to Paul Shortt at: pshortt@arlingtonva.us. Wandering the Pike is presented by Arlington Arts of Arlington Cultural Affairs, a division of the Arlington County Department of Parks, Recreation and Cultural Resources, uses the power of the arts to transform lives and build community, and provides programs and services to create an environment that encourages excellence in the Arlington arts community.